Picture this: you’ve rocked up at your campsite after a day on your feet and you’re dying to tuck into a tin of Stagg Chili, only you’ve forgot to bring a can opener. Or, here’s an even more worrying scenario: you forgot a bottle opener and have no way to open a triumphant post-walk beer… Well, it’s at times like these when having a multi-tool floating about in your back can be incredibly handy. In fact, some of the best multi-tools, with their clever array of handy features, can help pull you out of many a sticky situation. Whether you need to fix something, cut some wood, prep some food or fend off a vicious animal attack, they are designed to be there, by your side through it all. So what exactly do you want from a decent multi-tool? Well, to start with it needs to have a strong knife that will cope with your demands, whether that’s simply preparing food or something a bit more testing, such as splitting wood. An effective saw is also a good addition, while pliers, bottle openers and can openers are features we’d expect to see. Beyond that, a range of screwdrivers, a corkscrew, scissors and a wrench can be helpful. At a penny under £20, the Highlander Condor is the cheapest multi-tool in test by quite a way, making it a very attractive option, but how does it perform? Well, the ergonomics are great, and the Condor feels very nice to hold in the hand. It has a good range of features, including pliers, wire cutters, a bottle/tin opener, a 5cm serrated knife, 6cm blade, file, screw drivers, plus a nine-piece socket set. Unfortunately, the tools don’t lock when they are being used and, even when not in use, they would occasionally fall out. While this can be frustrating, it’s important to remember just how cheap this multi-tool is. The knife isn’t the sharpest out of the five we’ve looked at here, but it should do simple jobs without much fuss and would be fine to use for cutting food, for example, but there are larger blades elsewhere. We also found the wire cutters on the Condor weren’t the most effective, struggling the most out of all on test, and while the pliers were good enough, the spring did go missing within an hour of use. Ultimately, the quality of the Condor doesn’t quite match up to some of the others on test, but you can’t ignore the price. For a casual user who wants something affordable, lightweight (290g) and good-looking for occasional use, it’s worth considering. 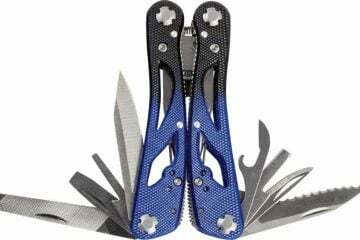 The Suspension & Mini Paraframe Combo from Gerber is another affordable multi-tool at just £43. Included in the toolset, you’ll find a saw, scissors, pliers, wire cutters, a fine and serrated edge blade, screwdrivers and a bottle/can opener. 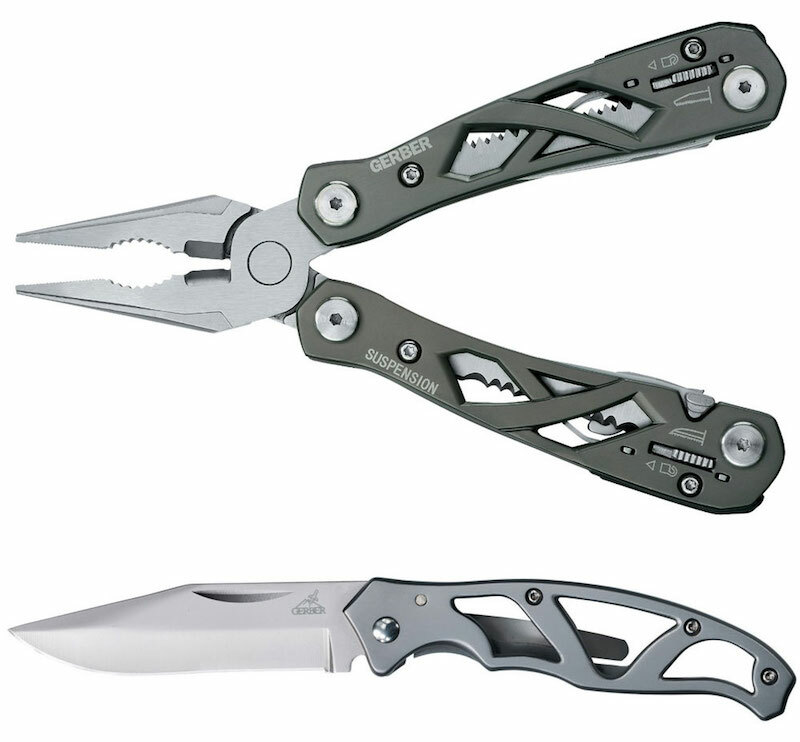 The multi-tool also comes with a mini paraframe knife, which is handy, though we did find the locking mechanism quite tough to adjust so the knife could slide away. All of the tools lock, which is good, and the saw did a good job of cutting through a lump of wood, though the Leatherman and SOG products performed just that bit better with longer tools. The knives are sharp and strong, though we would have liked them to be slightly longer. 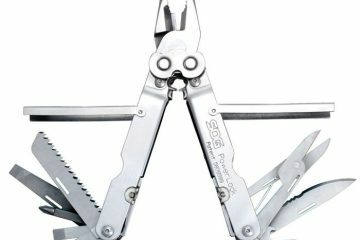 The pliers are sprung, making them easy to use, and the tool feels comfortable in the hand, but the wire cutters didn’t prove to be as effective as the Leatherman , SOG and Victorinox options. 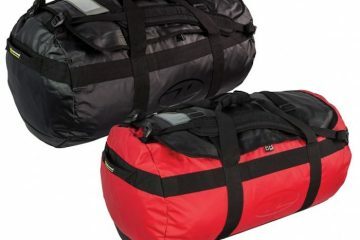 Weighing 316g, the Gerber Suspension isn’t that heavy and it is quite compact once packed away in its pouch. It doesn’t offer the same usability as a multi-tool with hex bits, and a few of the tools might fall short of being the best in test, but at £43 the Suspension offers a great compromise between quality and value. At £91.95, the SOG Powerplay with Hex Bits sits in the middle of the price range in this test and it offers great value. It looks slick and this first impression only continues when the multi-tool is in use. It feels especially smooth when opening up the tool to use the pliers, and the build quality is impressive. Nothing rattles or moves when it shouldn’t, and all the tools proved to be strong. There are 18 tools in total, including two large blades (straight and serrated, which can both be accessed without opening the tool), screwdrivers, pliers, wire cutters, saw, file and a can/bottle opener. The knives are sharp and, along with the Leatherman, the saw is the most impressive on test, making short work of some tough wood. The pliers and wire cutters are effective and when closed, the top has a hex driver built into the mechanism, allowing you to use one of the 12 hex bits that come supplied with it. That’s all good then, so what would stop you buying one? Well, it’s the heaviest multi-tool in test at 367g (with hex bits and pouch), which may figure in your thinking, and the tools can feel slightly stiff when trying to use them, but this should ease with use. 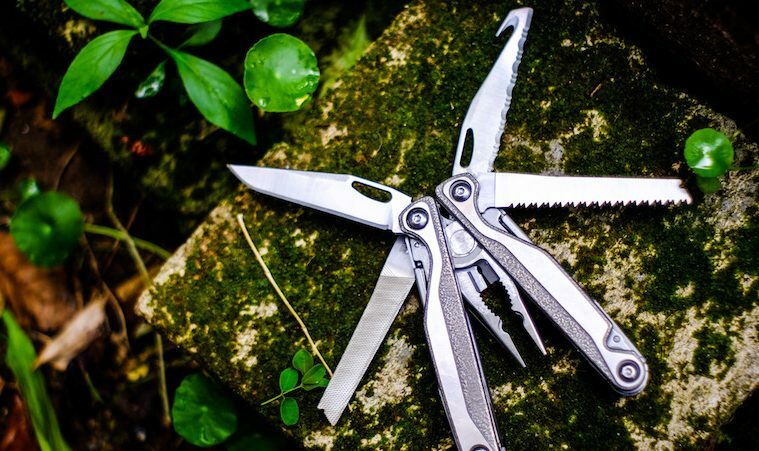 This is a very good multi-tool at a decent price and there isn’t much to go against it. Victorinox is a brand that has long been one of the leaders in the multi-tool sector and it’s easy to understand why. The SwissTool Spirit XC Plus is a thing of beauty. It comes with a gorgeous leather belt pouch and the tool is constructed of smooth stainless steel. It screams quality, as you would expect for a tool that costs £160. With 37 functions, usability is at the centre of this multi-tool and it has pretty much everything you might need, including a knife, corkscrew, pliers, wire cutter, screwdrivers, bottle/can opener, scissors and wood saw. Beyond that, you’ll also find a set of six hex bits and a separate bit wrench. 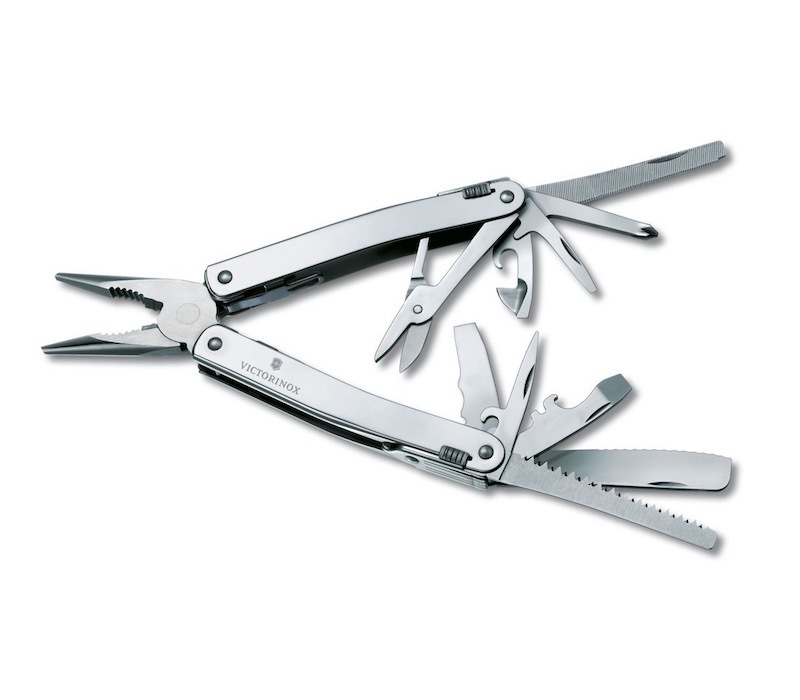 All of the tools lock and the multi-tool sits comfortably in your hand when in use. The performance of most of the tools is strong, with a large, sharp blade handling simple tasks well and very effective pliers and wire cutters. One tool that didn’t quite live up to the billing was the saw, which struggled to slice through some wood as smoothly as many of the others on test. We would have also liked to have been able to operate some of the essential tools one-handed, but this isn’t possible. 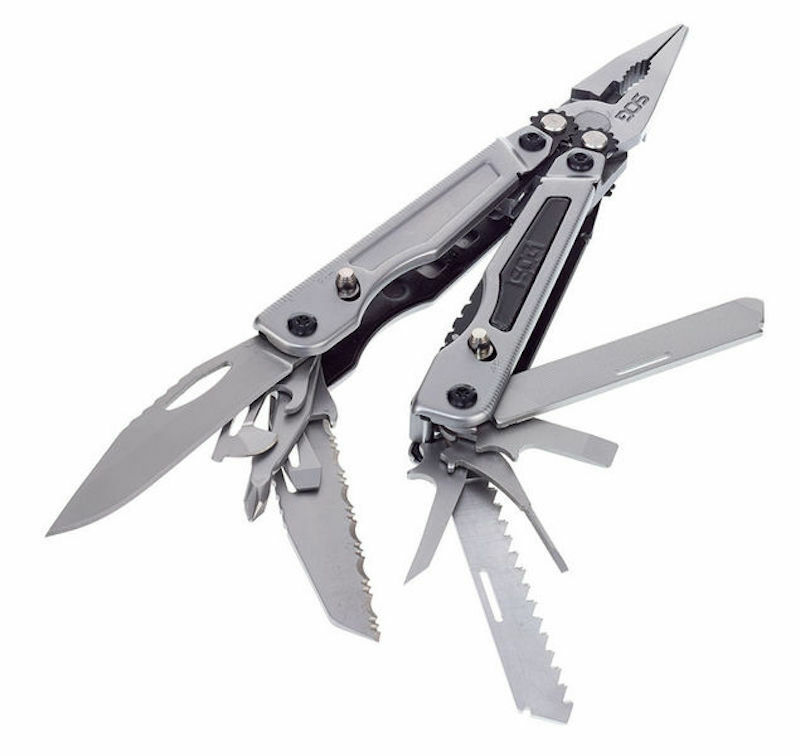 At 359g, this is one of the heaviest tools on test, and while it is undeniably a very good piece of kit, the Leatherman and SOG multi-tools are perhaps more suited to the rugged nature of the outdoors. 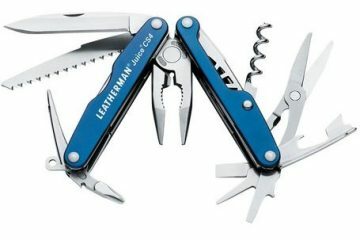 Put simply, the Leatherman Signal is an awesome piece of kit. It looks the business and performs very well. 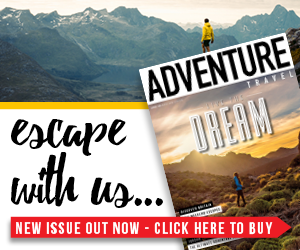 There are 19 tools on offer, including pliers, wire cutters, wire stripper, a large, sharp knife, a very effective saw, a hammer, can/bottle opener and a karabiner. You’ll also find a detachable ferrocerium rod for creating fires and a diamond-coated sharpener for the knife, which are both nice additions. 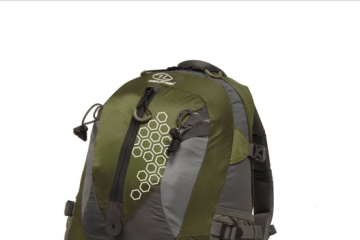 At 245g, it’s the lightest in test and is probably the one that is best suited to the outdoors. The hammer is great for securing tent pegs, the knife and saw are both large, effective and useable with just one hand, the ferrocerium rod easily produces sparks for fire starting and there is an emergency whistle, too. All of the tools lock and the ergonomics are spot on, making it a comfortable experience when in use. The pliers are excellent and the wire cutters do a very good job, though the SOG and Victorinox tools are slightly more efficient. The Signal also comes with a karabiner clip, allowing you to clip it onto your pack or belt, plus a black nylon sheath with belt loop. Despite all of the positives, there were a couple of minor disappointments. For one, after light use, part of the plastic on the ferrocerium rod developed a crack, meaning I was no longer able to clip it into the multi-tool. Another frustration was that, while using the knife to split down some wood, the piece of metal that locks the blade in place bent, meaning it’s now a mammoth task to force the knife back into place without taking out a finger. It’s worth noting that it was dealing with some tough treatment when it happened, so as long as you’re not going to be using it with excessive force, the knife will handle most of what is thrown at it. 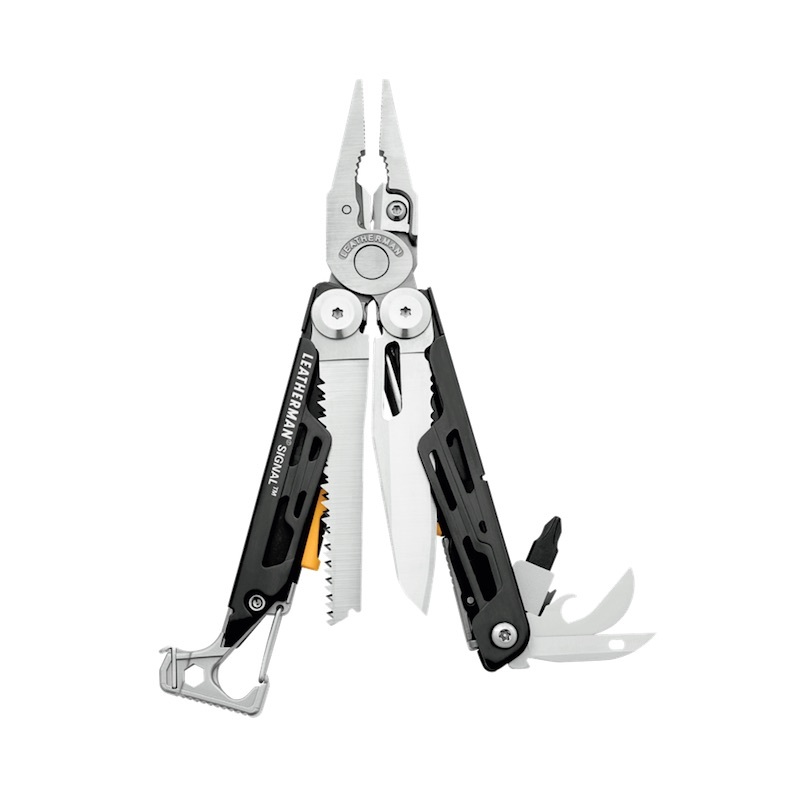 At £159.99, the Signal is one of the most expensive multi-tools in test. 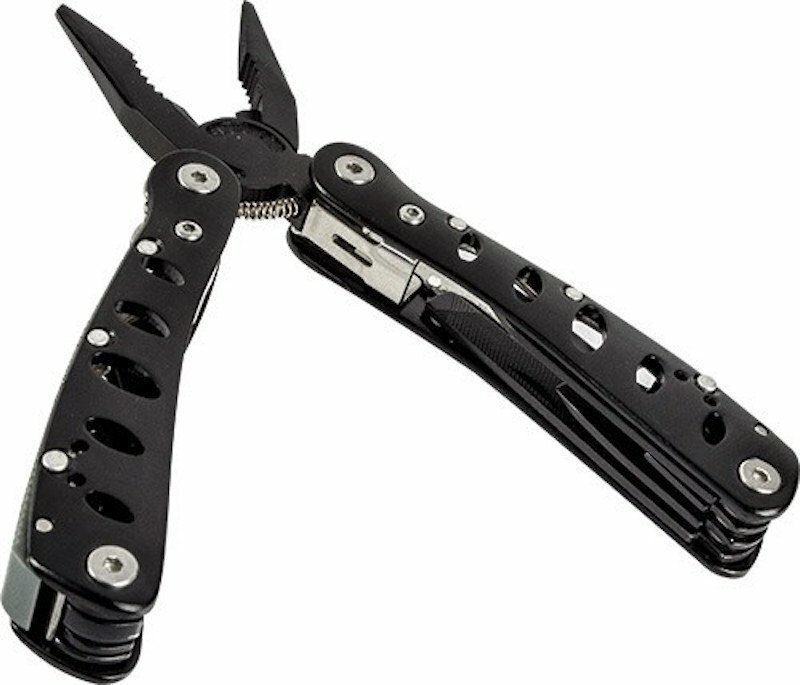 Part of that cost can be attributed to the fact that it is a Leatherman, but it’s also worth noting that this is a very good piece of kit. It looks the part, performs well and is very handy to have around. If you’ve got the money, go for it. Otherwise, the SOG Powerplay is a very serious contender for best in test.